* 4 NEW Aldelo (formerly NextPOS) licenses 30 days of free software support included. Click here to download an Aldelo demo (29 MB). Aldelo for restaurants will support your pricing plan for pizzas. With the ability to price by halves, thirds and quarters easily and efficiently, you won't have to worry about whether you POS can accommodate your pricing plan. Keep track of orders that are enroute, delivery time, which orders have been taken by what driver. Easily keep track of driver sales. All the things you would expect you delivery system to take care of! Fully automate your inventory tracking, the smarter way! Example... You sell a happy meal. When you do, the system takes out of your inventory the burger, bun, cheese, ketchup, pickle, fries, soda, cup, lid, box, and the happy meal toy. You have a reorder level of 25 burger patties, and you are now down to 24. You go to the purchase order screen and the system will create a purchase order for your burger supplier with all of the items that you receive from them that are below the reorder level. Use the inventory system if you would like, or keep track the old fashioned way, or use a bit of both systems. Aldelo will work with you. Are you running an ethnic restaurant, and have staff that don't speak 100% English? Not located within the United States, and need to display the software interfaces with a language other than English? No problem! Aldelo For Restaurants is 100% multi-lingual, and it will show the screen interfaces in your staff's preferred language. Aldelo For Restaurants currently supports 100% multi-lingual operation at POS & Back Office with English, Spanish, Traditional Chinese, and Simplified Chinese. What's more, Aldelo For Restaurants can also be configured so that it will send the order to the kitchen or bar in a different language than the guest receipt! There is also default global language setting and follow me language display technology to further enhance multilingual operation. Additionally, our software solution is also internationalized. It is able to handle your regional specific currency symbols, date and time formats, decimal symbols, and others. With Aldelo For Restaurants software solution's operation simplicity and ease of use, your employee high turnover rate will be a concern of the past! Aldelo For Restaurants software solution allows you to train your new employees faster with less time and money spent. With 100% touch screen operated point of sales, super easy to follow screen layouts, and the simplicity of Windows based interface, your wait staff will be able to use the software in a matter of minutes, rather than days! Best of all, there is no prior computer knowledge required from your wait staff. And of course, our software does not use those awkward product codes, so your staff is not required to memorize them. A big time saver over those older POS systems that do require you to memorize them! Whether your current restaurant system is paper based or another POS software solution, Aldelo For Restaurants software is the ideal software to replace your current system, and give you much better control and efficiency! Aldelo For Restaurants software solution will save you both time and money by improving your restaurant operations. If you have ever been serious about increasing your restaurant's efficiency & profitability, then seriously consider using Aldelo For Restaurants software solution for your establishment. Aldelo For Restaurants software is state of the art Windows based touch operated restaurant solution. 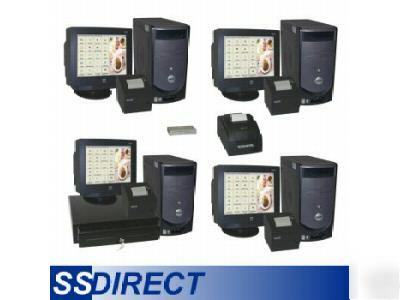 It is affordable, easy to use, feature rich, 100% touch operated point of sales, and 100% multi-lingual. Aldelo For Restaurants is the only restaurant software solution that you will need for now and for the future! * View your occupied table, need to clear table, available table, table served time, and other information directly from table layout screen. You can also define table attributes such as near windows, smoking section, private seating, booth, maximum seating capacity, hibachi table, and more. * Advanced support with YES-TELE caller ID box that will support up to 8 caller ID telephone lines. Giving you up to 8 line caller ID monitoring from each of the computers. * Speed up your payroll process with our payroll preparation report, it calculates all your important payroll information, except the payroll taxes of course!